Keeping detailed pulse and tongue diagnosis is a great way to keep a "pulse" on your patients' health. (Pun intended.) The good record keeping gives you a clear view into your patients' health history when you go back to review it with them. In the days of paper and pencil, acupuncturists would make their own treatment note templates, often times borrowing from student clinics or more established acupuncturists. Now that we can harness the power of the Internet and a true SaaS platform in Salesforce, we have the opportunity to share, build and innovate the traditional acupuncturists' SOAP Note. In this latest update to the SOAP Note, I'm excited to share that we've added the ability to track more advanced pulse and tongue diagnosis. 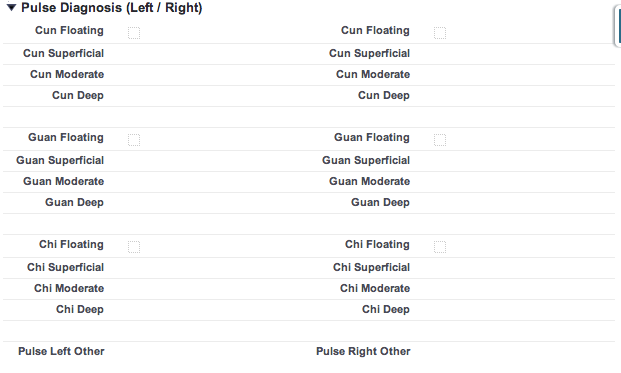 For pulse diagnosis, you can now easily track all 3 positions, Cun, Guan, and Chi, in both left and right hands of the patient. 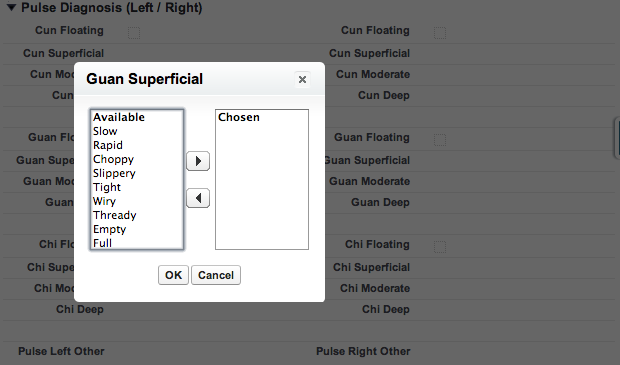 And in addition, you can track the 3 levels, Superficial, Moderate, and Deep. We've also added the ability to easily pick values for the pulse quality of your patient, so that it reduces the amount of typing a practitioner has to do. For tongue diagnosis, we saw an opportunity to take advantage of new technology like tablets to capture information about a patients' tongue. You can now take a picture of a patients' tongue and attach it to their SOAP Note, in addition to information such as the tongue shape & size, color, and coating. In addition, we've provided default values for many of the fields to make note taking easy and quick. I believe having quick and easy note taking is a vital part of running an efficient practice and will continue to invest and innovate the SOAP Notes in Jasmine Practice Management.